Chinese cooking techniques (Chinese: 中餐烹調法) are a set of methods and techniques traditionally used in Chinese cuisine. The cooking techniques can either be grouped into ones that use a single cooking method or a combination of wet and dry cooking methods. Many cooking techniques involve a singular type of heated cooking or action. 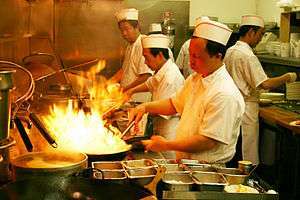 Wet-heat, immersion-based cooking methods are the predominate class of cooking techniques in Chinese cuisine and are usually referred to as zhǔ (煮). In fact the term zhǔ is commonly used to denote cooking in general. Braising 烧 Shāo Braising ingredients over medium heat in a small amount of sauce or broth and simmering for a short period of time until completion. Known as hong-shao (红燒, lit. 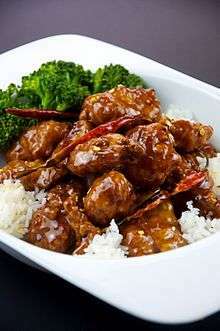 red cooked) when the sauce or broth is soy sauce based. Quick Boiling 氽 or 煠 Dǔn or Zhá Adding ingredients and seasonings to boiling water or broth and immediately serving the dish with the cooking liquid when everything has come back to a boil. Scalding 焯 or 烫 Chāo or Tàng Par cooking through quick immersion of raw ingredients in boiling water or broth sometimes followed by immersion in cold water. Bake stewing 煨 Wēi Slowly cooking a ceramic vessel of broth and other ingredients by placing it in or close to hot embers. Gradual simmering 炖 Dùn Adding ingredients to cold water along with seasonings and allowing the contents to slowly come to a prolonged simmering boil. This is known in English as double steaming due to the vessels commonly used for this cooking method. 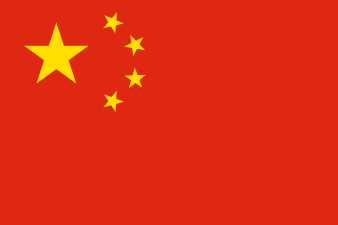 The term is also used in Chinese for the Western cooking technique of stewing and brewing herbal remedies of Traditional Chinese medicine. Slow red cooking 卤 Lǔ Cooking over prolonged and constant heat with the ingredients completely immersed in a strongly flavoured soy sauce based broth. This technique different form, but in English, synonymous with Hóng shāo (红燒). Steaming 蒸 or 燖 Zhēng or Xún Steaming food to completion over boiling water. Decoction 熬 Áo Cooking slowly to extract nutrients into the simmering liquid, used to describe the brewing process in Chinese herbology with the intention of using only the decocted brew. Zhangcha duck is a dish whose preparation involves steaming (蒸; zhēng), smoking (熏), and deep frying (炸). Smoking 熏 Xūn Cooking in direct heat with Smoke. The source of the smoke is typically sugar or tea. Stir frying (爆; bào) is a Chinese cooking technique involving relatively large amounts of oil. Pan frying 煎 Jiān Cooking in a pan with a light coating of oil or liquid and allowing the food to brown. Stir frying or high heat Sautéing 炒 Chǎo Cooking ingredients at hot oil and stirring quickly to completion. This technique, as well as bào chǎo and yóu bào (爆炒 and 油爆), is known in English as stir frying. This technique uses higher heat than that of Sautéing. Flash-frying or High heat Stir frying [油]爆 [Yóu]Bào Cooking with large amounts hot oil, sauces (酱爆; jiàng bào), or broth (汤爆; tāng bào) at very high heat and tossing the ingredients in the wok to completion. Plain stir-fry or Simple stir-fry 清炒 qīngchǎo To stir-fry a single ingredient (with aromatics and sauces). A plain stir-fry using garlic is known as 蒜炒, suànchǎo. Scramble stir-fry 软炒 ruǎnchǎo A technique for making egg custard. Dressing 拌 Bàn Mixing raw or unflavoured cooked ingredients with seasonings and served immediately. Similar to tossing a dressing into salad. Marinating or pickling 腌 Yān To pickle or marinade ingredients in salt, soy sauce or soy pastes. Use for making pickles or preparing ingredients for addition cooking. Liū (溜): This technique is commonly used for meat and fish. Pre-fried tofu is made expressly for this purpose. Finishing the ingredients lightly braising (燒; shāo) it to acquired a soft "skin"
Cover and simmer (燒; shāo) with broth until broth is fully reduced and ingredients are fully cooked. ↑ Kho, Kian Lam. Phoenix Claws and Jade Trees: Essential Techniques of Authentic Chinese Cooking. ↑ Kho, Kian Lam. "Stir-fry Fortnight III – Plain Veggie Stir-fry". Red Cook. Retrieved 31 December 2015. ↑ Kho, Kian Lam. "Stir-fry Fortnight V – Dry Wok Stir-fry". Red Cook. Retrieved 31 December 2015. ↑ Kho, Kian Lam. "Stir-fry Fortnight IV – Moist Stir-fry". Red Cook. Retrieved 31 December 2015.